These methods are explained in more detail below. 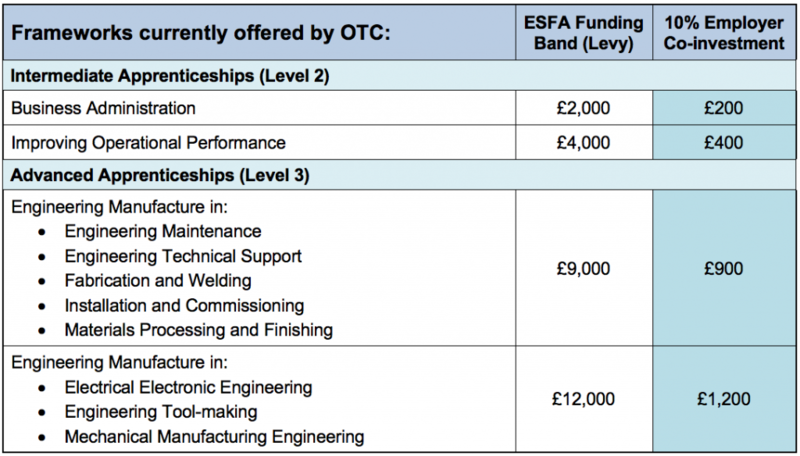 Employers who employ an average of less than 50 staff and take on an apprentice aged between 16 and 18 are currently entitled to full funding via the Education and Skills Funding Agency (ESFA). Employers will need to complete a self-declaration of eligibility and be able to evidence, to the ESFA, that they meet the requirements, should they be required to do so. Employers are required to co-investment 10% towards the cost of training of their apprentice/s. The remaining 90% is funded via the ESFA. The amount of employer co-investment varies depending on the programme that the apprentice is signed onto and OTC offers flexible ways to pay. 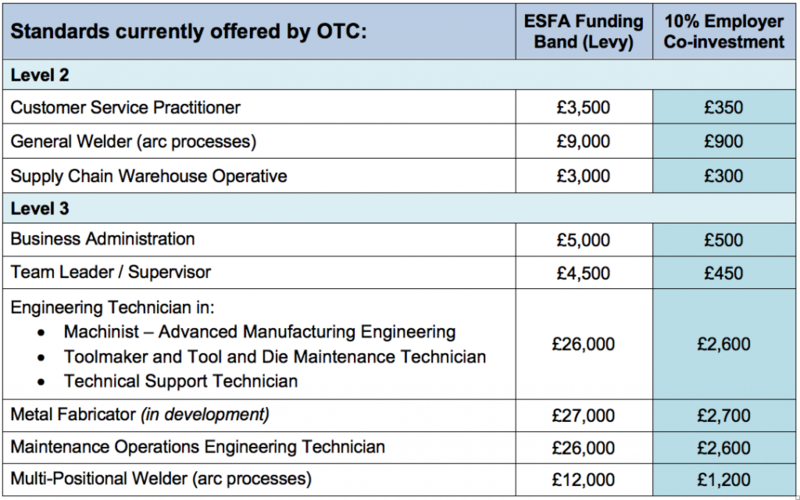 A full list of funding bands for the apprenticeship pathways OTC currently offers can be found at the bottom of the page. Employers who have an annual wage bill of £3M or more will pay into a levy account each month and is topped-up by 10% from the government. The Apprenticeship Levy is charged at 0.5% of the annual pay bill. Levy Employers are required to pay 100% of the funding for their apprentice’s programme, paid directly from their digital levy account each month. Where the employer has some funds available but these are not sufficient – the remaining balance will be paid through government-employer co-investment i.e. the employer will be invoiced by OTC for their 10% and the ESFA will pay the remaining 90%. *Funding may be reduced where the apprentice is able to demonstrate appropriate recognised and/or accredited prior learning/qualifications (RPL) which are directly relevant to the apprenticeship programme.